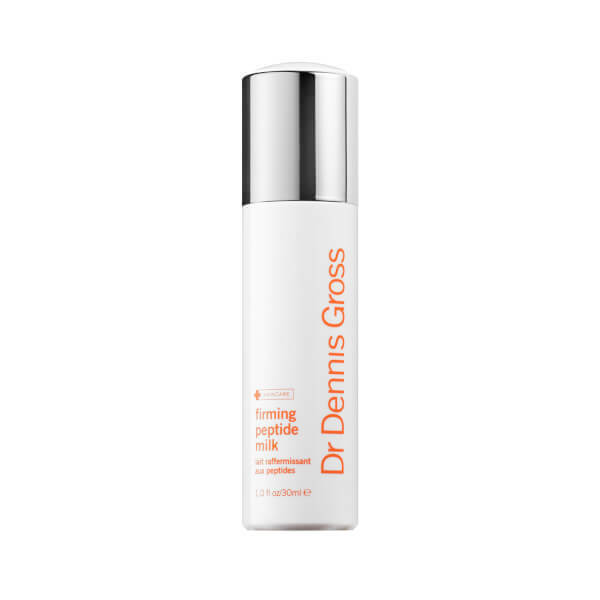 Meet the needs of thirsty skin with the Dr Dennis Gross Firming Peptide Milk; a bi-functional facial treatment that hydrates the complexion, whilst offering anti-ageing benefits. Harnessing the power of a state-of-the-art firming complex, the lightweight facial milk combines Tetrapeptide-21, Collagen Amino Acids and Ceramides. The potent cocktail of ingredients visibly firms and tightens the visage for an instant lifted look. Also boasting a nourishing blend of moisture-binding humectants and soothing Arnica, the formula envelops the skin in a veil of invigorating moisture, which eliminates and prevents dryness. 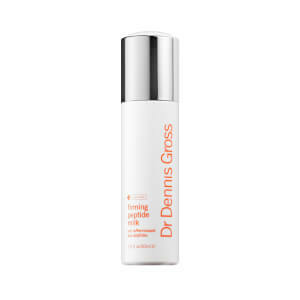 From the first application, skin looks smoother and more youthful, whilst boasting a luminous glow. Twist cap once to dose the correct amount of product. Unscrew cap and push the button to dispense exact dose onto fingertips. 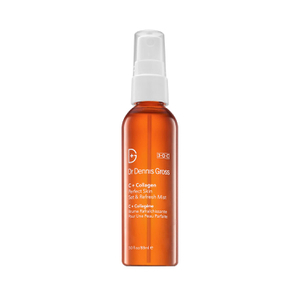 Gently massage into face, neck, and décolleté AM and/or PM. Follow with a moisturiser if needed (and a sunscreen in the AM). Water/Aqua/Eau, Dicaprylyl Ether, Propanediol, Squalane, Polyglyceryl-10 Mono/Dioleate, Polyglyceryl-3 Oleate, Glycerin, Cetyl Alcohol, Octyldodecanol, C14-22 Alkane, Tetrapeptide-21, Sodium Ascorbyl Phosphate, Collagen Amino Acids, Hydroxypinacolone Retinoate, Arnica Montana Flower Extract, Retinol, Sphingolipids, Phospholipids, Saccharide Isomerate, Sodium Hyaluronate, Leuconostoc/Radish Root Ferment Filtrate, Citrullus Lanatus (Watermelon) Fruit Extract, Pichia/Resveratrol Ferment Extract, Cocos Nucifera (Coconut) Water, Cocos Nucifera (Coconut) Fruit Juice, Sodium PCA, Sodium Bicarbonate, Butylene Glycol, Caprylyl Glycol, Cucumis Sativus (Cucumber) Fruit Extract, Glyceryl Cocoate, Glycine Soja (Soybean) Sterols, Acrylates/Carbamate Copolymer, Xanthan Gum, Cyclodextrin, Tetrasodium EDTA, Citric Acid, Sodium Citrate, Arachidyl Alcohol, Cetyl Hydroxyethylcellulose, Phosphatidylglycerol, Dimethyl Isosorbide, Hexylene Glycol, Hydrated Silica, Arachidyl Glucoside, Phenoxyethanol, Behenyl Alcohol, Potassium Sorbate, Sodium Benzoate.